What do Trakkers do in the off (i.e. non-snow) season to keep fit? 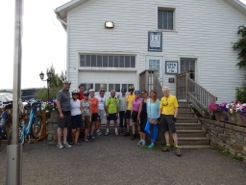 On Saturday, July 18th, eleven of our members plus four guests jumped on their bikes to participate in the 4th annual Spokes and Spigots Winery Bike Tour. After introductions and a pre-ride briefing at the Niagara Falls train station, we prepared to set off in the warmth of the noon-day sun, with Simon Monk generously checking and topping up the air pressure in each participant’s tires before our departure. Lead by Jim Girling, with Jannette Porter acting as “Sweep,” we skirted the top of the Niagara gorge on the paved recreational trail. Pausing briefly at the Sir Adam Beck Generation Station for a view of the churning river below and gardens above, we made our way to our first scheduled stop, Queenston Heights Park, for a picnic lunch. After resting in the shade and topping up our water bottles, we descended from the site of Major General Sir Isaac Brock’s fatal 1812 victory over the American invaders into the picturesque town where we rested momentarily opposite Laura Secord’s homestead to learn of her famous walk in 1813 to warn the British forces of another impending American attack. Leaving history behind us, we continued on the trail, following the breeze to our first tasting at the Ice House Winery where we discovered their refreshing wine-laced slushies. On our bikes again, we rejoined the path, passing through the cool of a wooded grove and traversing 3 wooden bridges before coasting into our next winery, Reif Estates. After lounging for a while under the patio umbrellas beside the burbling fountain, we indulged in some red and white wine served by our guide Randy who then took the group on a fascinating one hour winery tour and, of course, tasting. 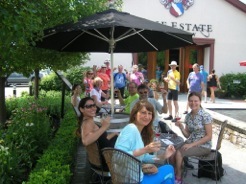 Once more on our saddles, we pedaled quiet secondary roads to our last winery of the day, Marynissen Estates. While some of the group perused their offerings, the remainder took advantage of the comfort of the lawn beneath the trees in anticipation of the return ride. Exiting the vineyards, with our purchases gently rocking in our packs, we climbed back into the urban area, stopping at a plaza to buy some fried chicken, salads or burritos, according to individual choice, before finishing our 40 km loop at the train station in time for those who had travelled by GO Transit’s Bike Train to catch the 7:20 p.m. to Toronto, bringing an end to an enjoyable day of exercise, fun and friendship. This entry was posted in Strong Trakker on July 30, 2015 by trakkers.